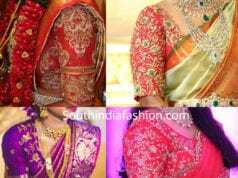 Latest Blouse Designs 12 Beautiful Pattu Saree Blouse Designs By Prathiksha! 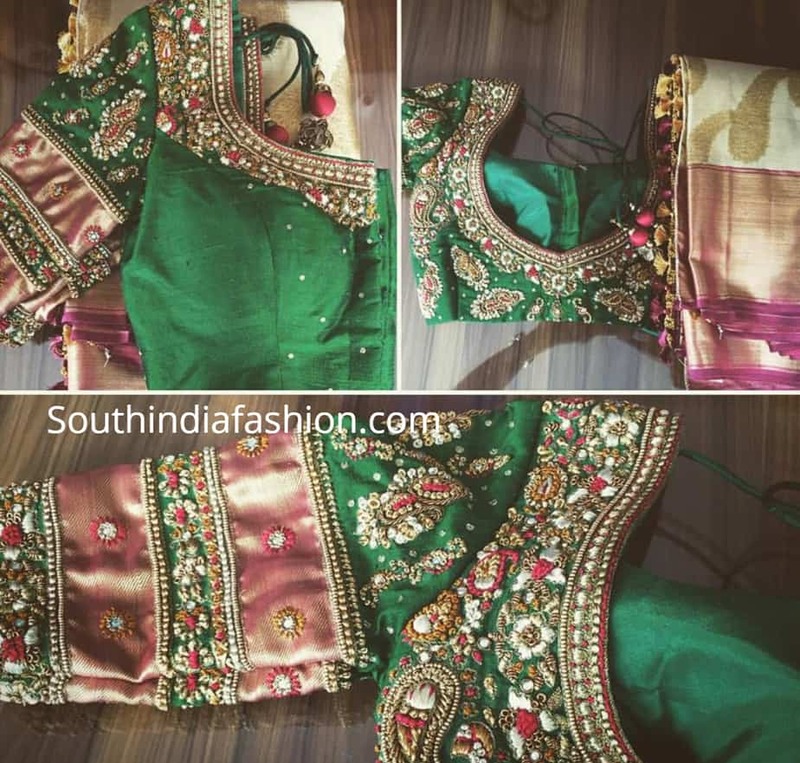 Prathiksha Design House, a Bangalore based fashion brand started by Prathiksha Hegde, specializes in saree blouses, gowns, salwar suits and so much more. 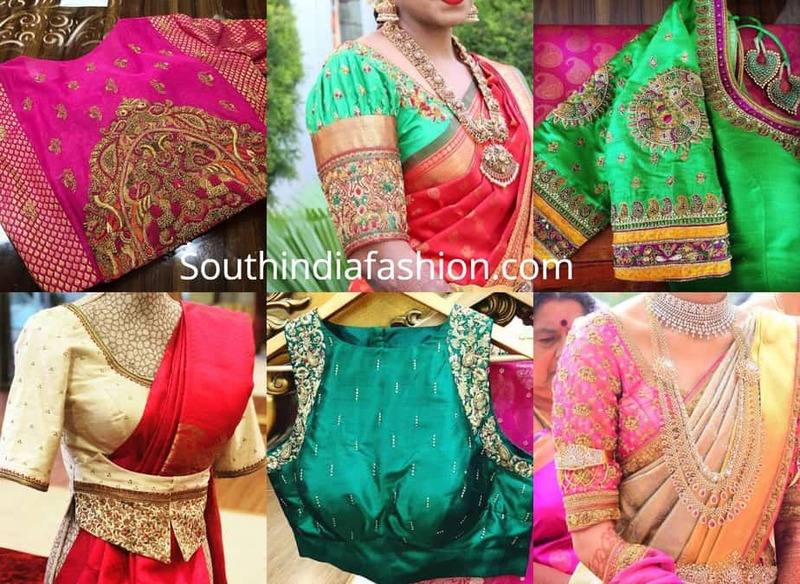 Scroll through a collection of some of their best pattu saree blouse designs below. 1. 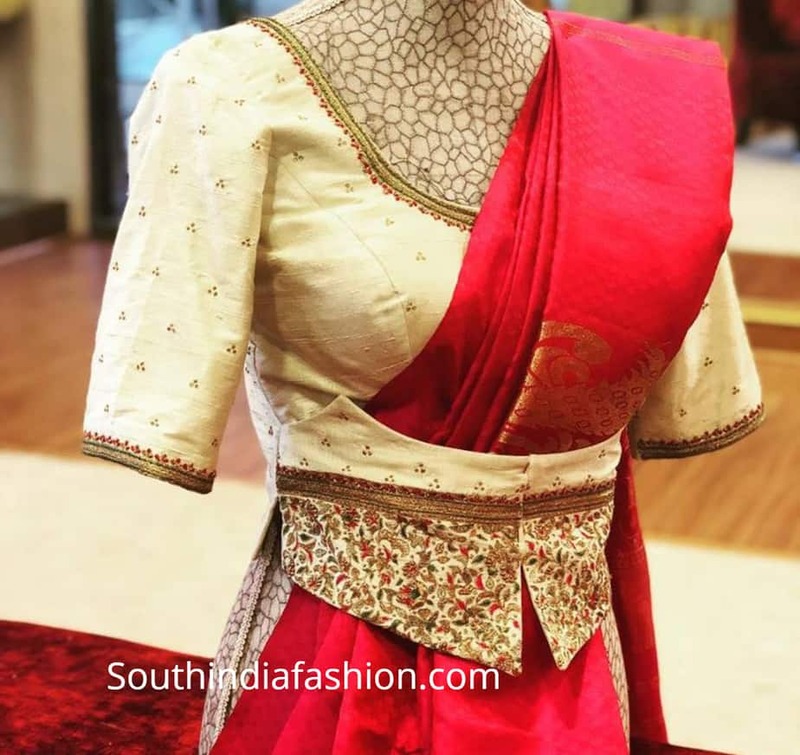 This pink, designer saree blouse by Prathiksha features the uniqueness of french knot embroidery and the elegance of peacock motifs. 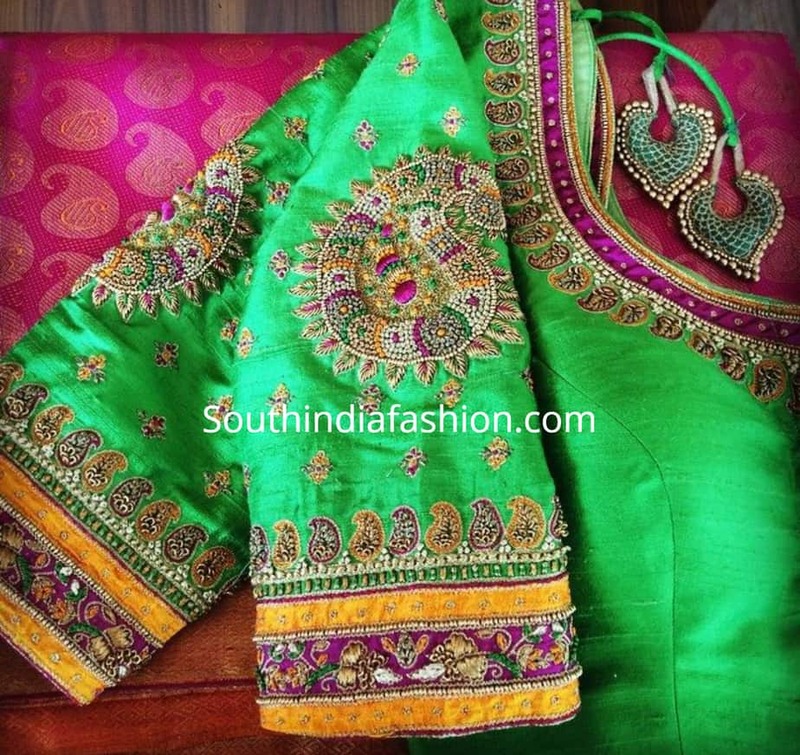 The french knots create a three-dimensional, embossed look, which looks great at the back of any pattu saree blouse. 2. 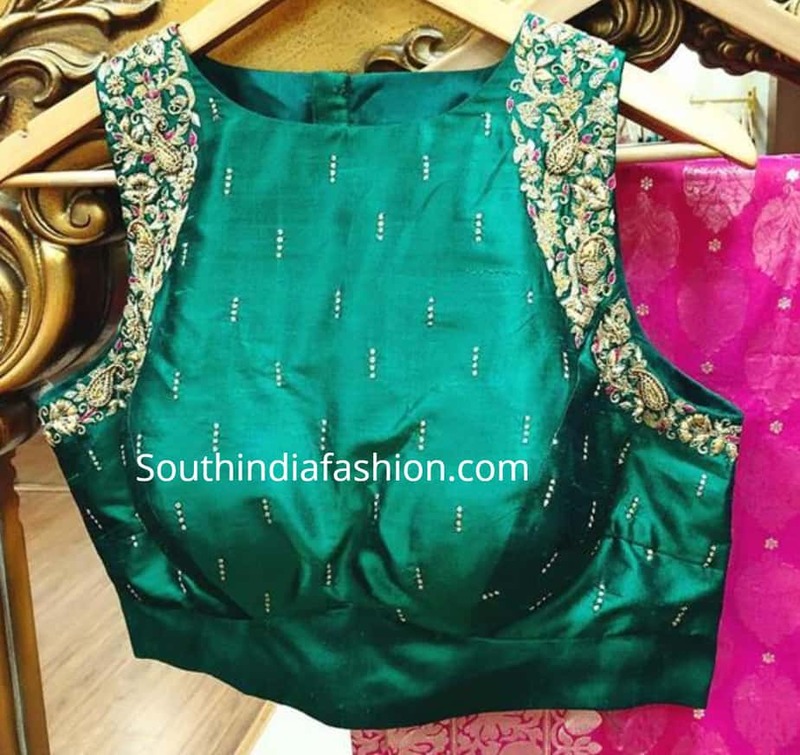 This emerald green blouse with paisley embroidery by Prathisksha is a true representation of how even minimal embroidery on the edges alone can look stunning. Pair with a contrasting saree for an edgy look. 3. 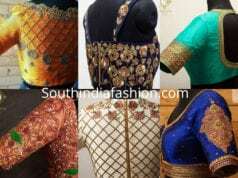 Ruffled sleeves are a big trend in 2019 and here’s a great way to incorporate them in your saree blouses. Voluminous and fluttery ruffled sleeves combined with a traditional kanjeevaram saree is a glam look for any occasion. 4. Wanna stand out in a crowd? 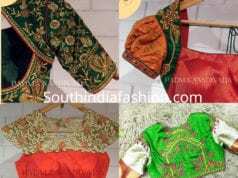 Look into jacket blouses.These types of unique blouses are yet another speciality of Prathiksha Design House. 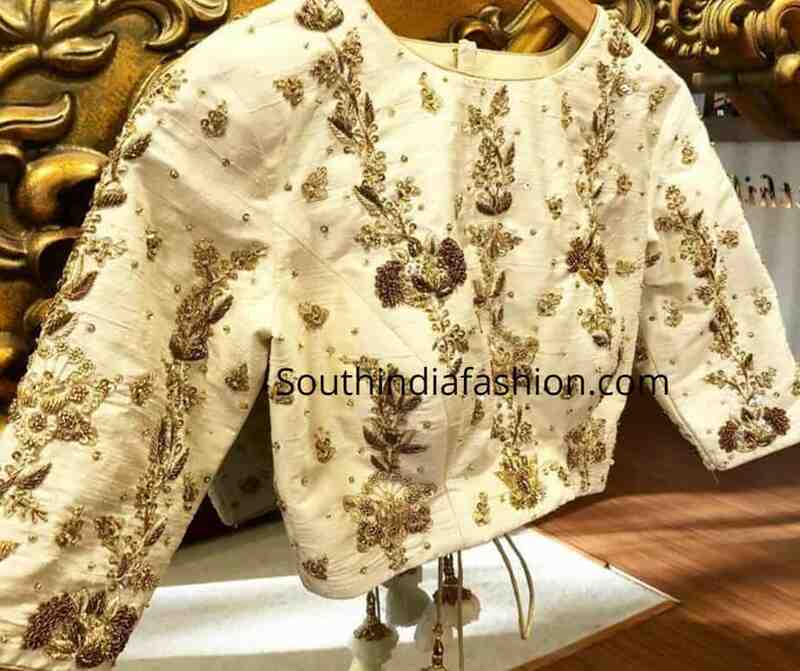 This particular one is beige with ari floral embroidery. 5. Keeping the bodice quite simple and going all out on the sleeves is a great idea for someone who wants a blouse that’s not too minimal and not too embellished. Here’s a perfect example of that designed by Prathiksha Design House. 6. Heavily adorned with ornate paisley motifs and flowers, this bottle-green blouse will put you on a pedestal no matter where you go. 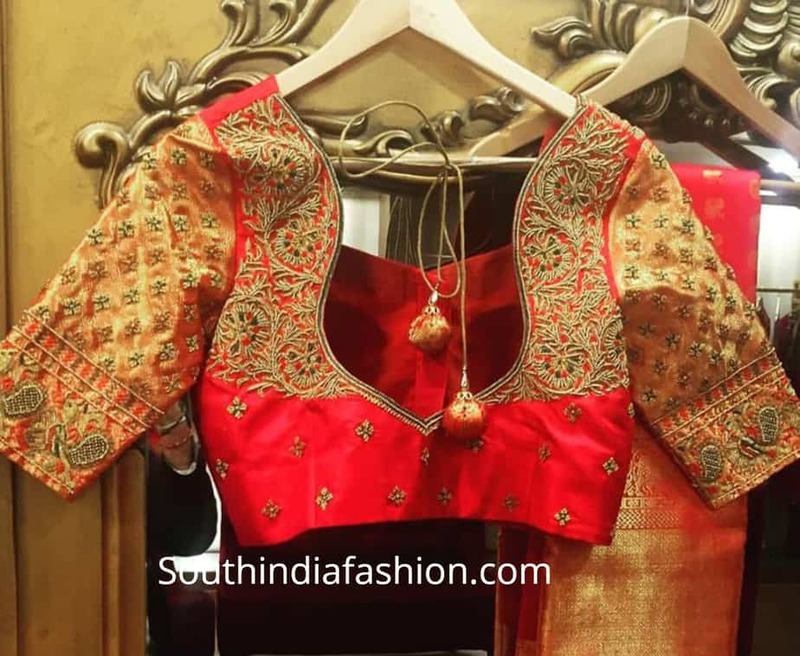 To pull off such a blouse, keep the saree simple so the blouse does all the talking. 7. You can never go wrong with a classic gold and red color combination. 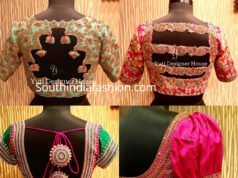 This designer saree blouse features traditional colors combined with ornamental hand work and a unique back opening. Team it with an off-white saree to highlight the blouse. 8. Off-shoulder blouses are another must-have item this season. It’s a trend that is sure to stay for a while. 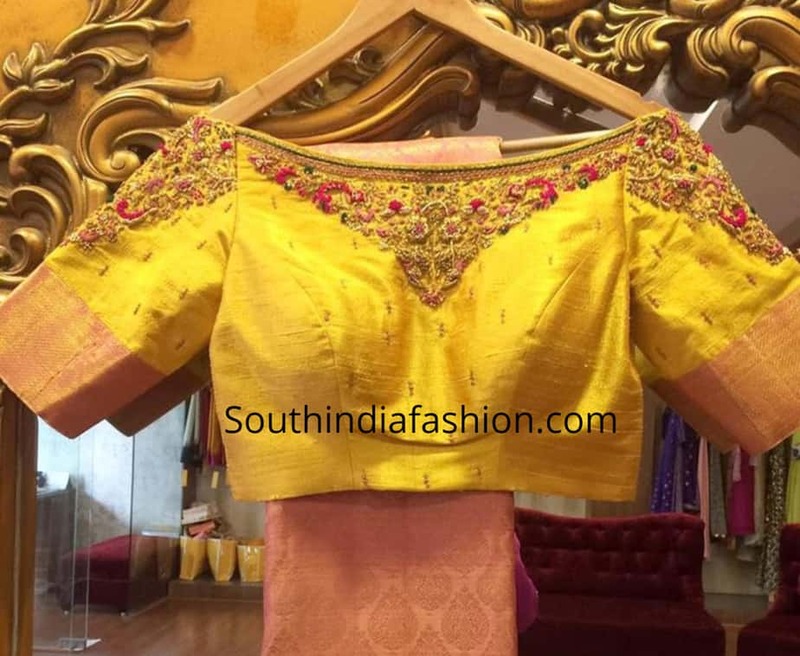 This mustard off-shoulder saree blouse is a unique creation by Prathiksha. 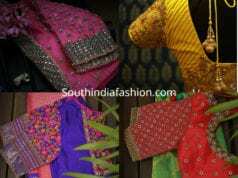 Pair it with a simple saree to make the blouse pop. 9. This detailed blouse features a cinched-in puff sleeve with floral embroidery at the neckline and heavy embellishment at the bottom half of the sleeve. Just what a bride needs to shine at her wedding! 10. Here’s yet another note-worthy design by Prathiksha. It’s an off-white raw silk blouse with intricate zardosi work. 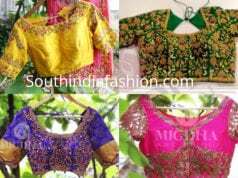 This kind of blouse is a wardrobe staple as it would pair well with pretty much any saree. 11. 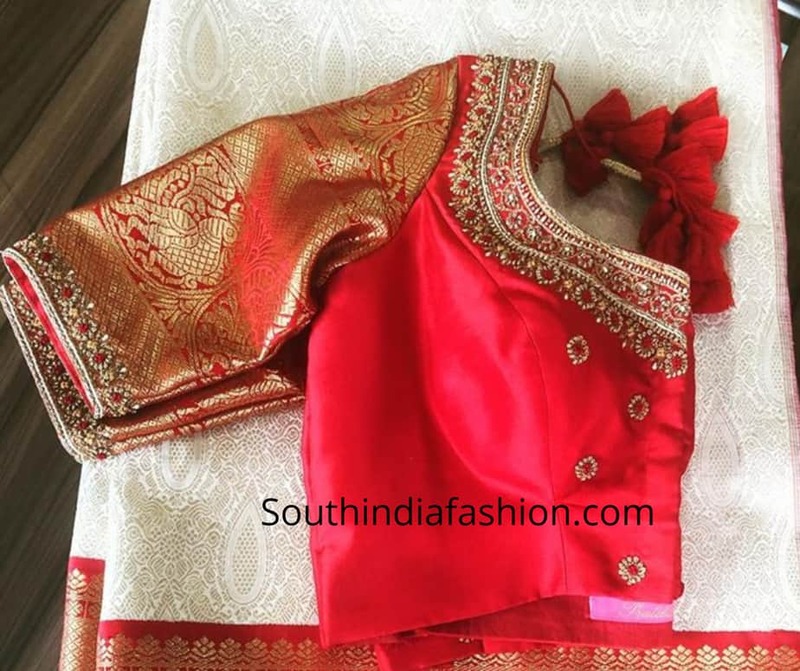 Versatile and chic, this red, hand-embroidered blouse is a great choice for weddings. Whether it’s for the bride or a guest, it’s a definite go-to choice. 12. 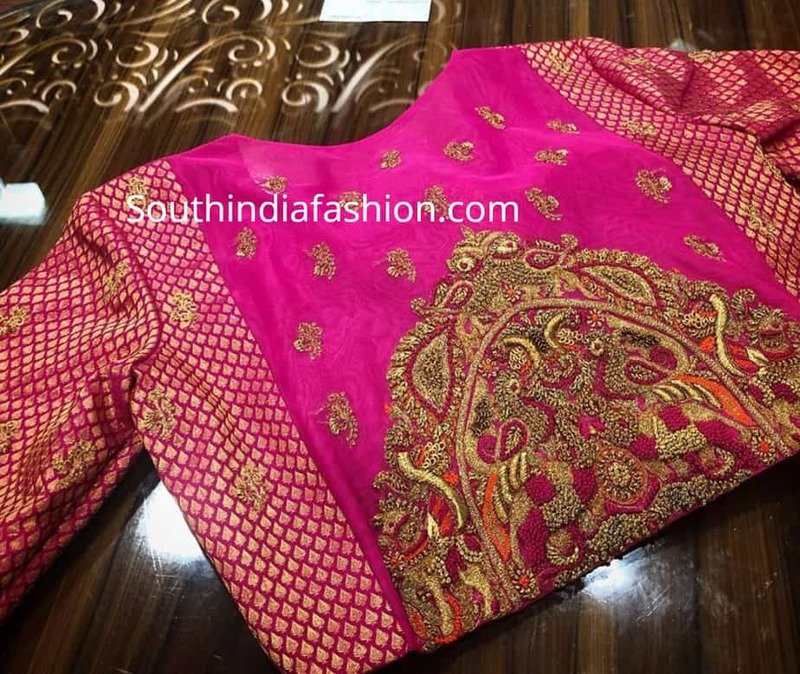 Yet another example of style and finesse, this bright pink blouse is intricately detailed with floral embroidery all over the bodice as well as sleeves. A wonderful option for brides who don’t like to stick to traditional wedding colors.